For the past three years I have been leading a Little Flowers Girls' Club for my girls and some of their friends. It has been such a rewarding experience and my girls have absolutley loved being Little Flowers. In addition to the suggestions in the Leader's Manuals, I started creating a series of Notebook Pages to go along with each virtue/saint, and also have really enjoyed coming up with snacks (or "Catholic Cuisine!") that tied in the Saint and/or Flower for each meeting. 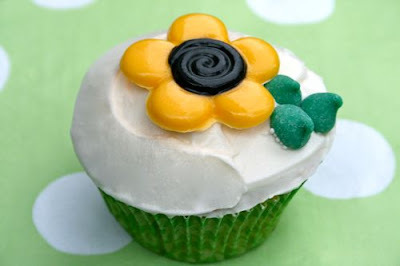 Orange Muffins topped with Cream Cheese Frosting, to be decorated by the Little Flowers with homemade Black Eyed Susan Chocolates (using this candy mold and candy melts) and the options of green mint meltaways, green color mist and/or green glitter gel. To make these delicious cupcakes, I used a package of Yellow Cake Mix, replacing the water with Orange Juice and added 1 cup of frozen cranberries and 1 cup of white chocolate chips. 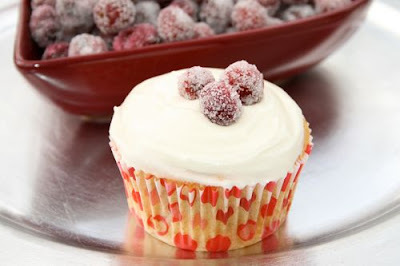 We topped them with some Cream Cheese Frosting, homemade Sugared Cranberries (Craisins would be a simple alternative), and served them with Sparkling Cranberry Juice. 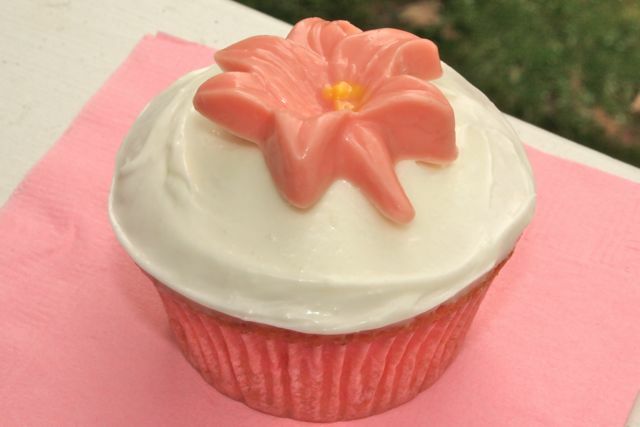 I started with Pink Cupcakes, with the help of a Strawberry Cake Mix, topped with Frosting. Using this Lily Mold I then topped the cupcakes with Pink (the color for this virtue) Amaryllis Flowers (the flower for this virtue) homemade with Pink and Yellow Candy Melts. These cupcakes were inspired by a recipe in What's New, Cupcake? 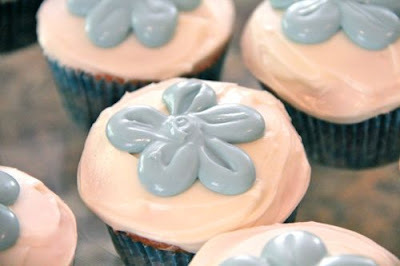 : Ingeniously Simple Designs for Every Occasion . They would be great to make this coming weekend for Mother's Day, anytime this month for our Blessed Mother during her month of May, or in July for the feast of St. Anne. 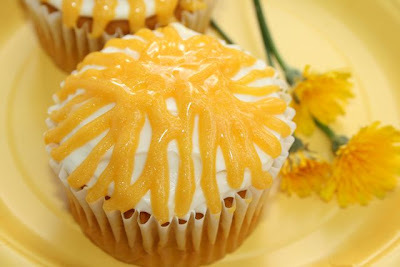 I posted the directions over at Catholic Cuisine! 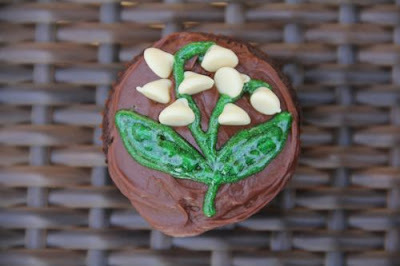 Chocolate Frosted Cupcakes, decorated with White Chocolate Chips and green frosting or Sparkle Gel . I wasn't sure how I was going to decorate the cupcakes this month. 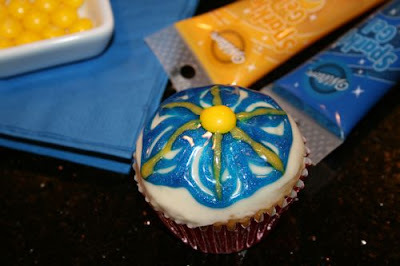 . . After looking at various images online of Blue Phlox Flowers I ended up making a little bit of blue frosting. 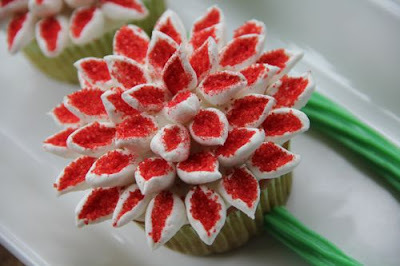 Using a round frosting tip, I put five drops (my kids said they looked like hershey kisses) on each cupcake, then, using the tip of a knife, I pulled the frosting drops towards the center, creating the flowers. I am a total amateur at this sort of thing, but I thought they turned out nicely! The Blue is for Our Blessed Mother and the Five Petals represent the five dimensions of Cheerfulness: Marian, Courageous, Heroic, Consistent, and Contagious. When I was looking for ideas, Charlotte mentioned that Pink Popcorn came to mind. I thought that was a perfect idea, but since I didn't have all the ingredients I opted to make the pink hyacinths using some pink Smooth & Melty Petite Mints (I had purchased a few bags at 75% off in January from Hickory Farms and had one left) along with a little green frosting for the leaves. 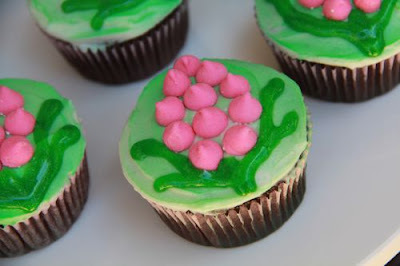 I also sprayed the white base frosting with a little green, before adding the candies. I thought they turned out cute, and they were very yummy despite the fact that my six year old pointed out that "the chocolate cake even looks like dirt!" You can view all of my posts for Wreath III here. 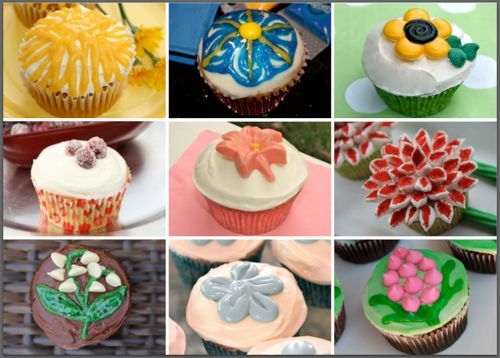 Those Cupcakes are some of the prettiest I've ever seen!! God bless your talent!!! I love them all! They look awesome and unique!! You never cease to impress!